Villarreal's Diego Forlan and Arsenal's Thierry Henry and will share the Golden Shoe award for being this season's top goalscorers in the European leagues. 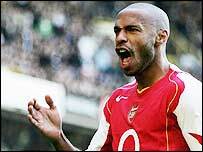 Ex-Manchester United striker Forlan scored twice on Sunday for his Spanish team to join Henry on the 25-goal mark. Henry becomes the first player to win the award two years in a row. It is only the second time it has been shared. In 1989/90 Bulgarian Hristo Stoichkov and Mexican Hugo Sanchez were the joint winners. Henry is the sixth player to win the award twice, joining such legends as Eusebio and Gerd Muller. Forlan's double came as Villarreal beat Levante 4-1 to clinch a spot in the next season's Champions League. Well done Forlan - why couldn't he do it at Man Utd? "It's been an incredible season and we couldn't have finished it in better style," the Uruguayan said. "I'm very happy to have ended up as top scorer as it is something that doesn't happen every day. "Qualifying for the Champions League is a prize that we all deserve as we worked hard for it throughout season." TNS striker Marc Lloyd-Williams has actually scored 34 goals this season - nine more than Henry. However, the predominantly semi-professional Welsh Premier League is not deemed strong enough to compete on level terms with many other European divisions. Therefore, Lloyd-Williams appears much lower down the ratings. The number of goals scored by players in the top divisions in Spain, Italy, Germany, France and England are doubled to determine their Golden Shoe rating, reflecting the greater difficulty in scoring in these leagues compared to others.